Kelly is co-coordinator of Voices for Creative Nonviolence. She has repeatedly been nominated for the Nobel Peace Prize. Orkin is with Veterans for Peace. The two are among a dozen groups now organizing protests “at the Saudi consulate and several missions to the UN” on Wednesday and Thursday. They are calling for “dramatic measures to avoid famine” and note that protesters are “willing to risk arrest on Thursday.” See specifics for actions at UN, including photo opportunities. “Raytheon, General Dynamics, Boeing, and Lockheed Martin have sold billions of dollars’ worth of weapons to Saudi Arabia, the United Arab Emirates and other countries in the Saudi-Emirati-led coalition. 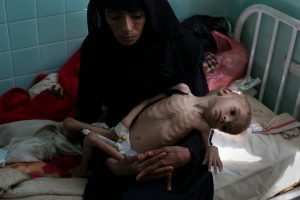 “Isa Blumi, an associate professor at Stockholm University and author of the book Destroying Yemen, believes the goal is to bludgeon Yemenis into complete submission and exert control over resources, including oil reserves, natural gas, minerals, and a strategic location.